- FrancesCassandra: UK fashion, beauty and lifestyle blog. : Wishlist: Pastel Pink. I have never really considered myself to be particularly girly and pink was never a colour that appealed to me very much, but after the Debenhams' SS14 Lookbook popped in to my email inbox and I fell for the looks by Red Herring (pictured above- that long line jacket, though! ), I have gone a little loopy for the pastel pink trend. Naturally, I went on to spend a little too much time browsing online and filling up my theoretical shopping basket, only to be brought back down in despair by the fact that I am actually not a millionaire. So, instead, I thought I would compile together a very pink wishlist of some of my favourite finds so that you can lust over them, too. I'm just thoughtful like that! The pastel pink boyfriend coat is definitely the statement piece of the season, but despite seeing them left, right and centre, I have had trouble finding one that is the perfect length and the perfect shade of pink. That is until I came across this one. Primark, of all places! At £32 it is a steal and has definitely taken the top spot on my wish list. Ahh what girl hasn't dreamed of having the infamous Alexander Wang Rocco bag in her collection? Well, browsing on Morgan Clare a few days ago I may have stumbled across a new love, in the shape of the Lia Messenger bag. Pastel pink leather and rose gold studs- What more could you want (except maybe a lower price tag)?! It's pink, it's cropped and it's sparkly, therefore I love it. This little number would look fab paired with a faux leather skater skirt or the matching pencil skirt. If pink isn't really your thing, who says you can't use accessories to subtly incorporate it in to an outfit? Just imagine you're like Audrey Hepburn, channeling Breakfast at Tiffany's in an elegant black ensemble. And then add this necklace. Yes, I thought so, too. Now, this number may have sneakily found it's way in to my wardrobe already, and it's wonderful, trust me. I'll prove it in an outfit post soon, I promise! 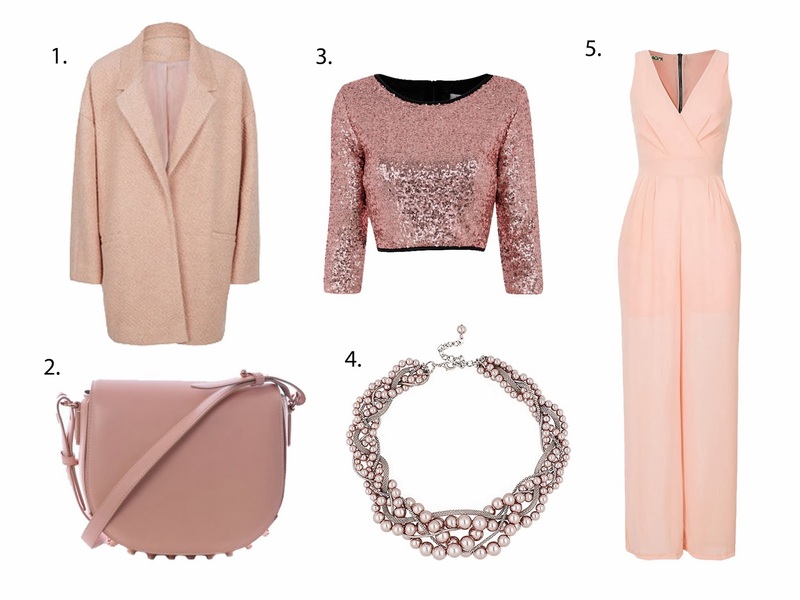 Are you loving the pastel pink trend this season? What is your favourite piece from my wishlist? Nice post! Love your selection! Great picks, the jumpsuit is amazing! ahh anything pastel is gorgeous! love the pastel coat! Pretty pastels :) I wish I could pull these off, I'm so paranoid that I look daft in these kinds of colours. I really like pastel colours! Spring is coming, let's wear it!